Yes that's all!! You need some crisco to grease your hands, but I didn't have any. So I thought of dusting my hands with powdered sugar, which I forgot to do. This is a very important step otherwise you will end up with a super duper mess. If that happens, just rub your hands with powdered sugar and you are good to go. In a large microwave safe bowl, pour in the mini marshmallows and water. Microwave 1 minute on high. 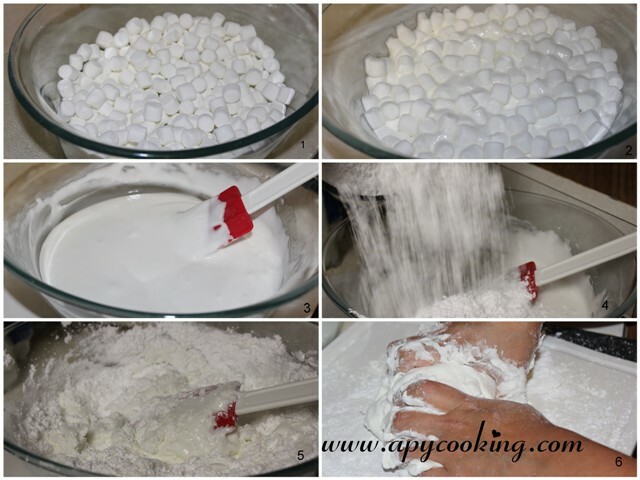 Remove and mix thoroughly, pressing the marshmallows, till you get a smooth paste. [If required, microwave for a few more seconds]. Pour powdered sugar. Mix, mix, mix. Dust your palms with powdered sugar. Transfer the mixture to a clean cutting board and knead for a few minutes. Add a little more powdered sugar if required. 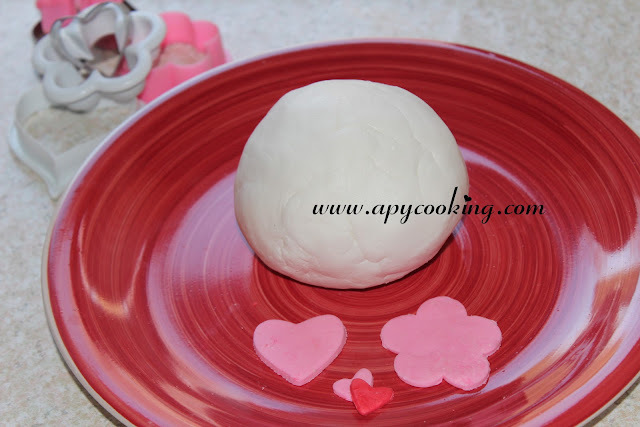 Knead, knead, knead till you get smooth and pliable fondant. If you'd like to colour your fondant, then dip a tooth pick in the colour, pull it across the required amount of fondant and knead again. You will see the colour in streaks. Knead well. Roll using a fondant roller or chapati roller. Using cookie cutters or fondant cutters, cut into desired shapes. 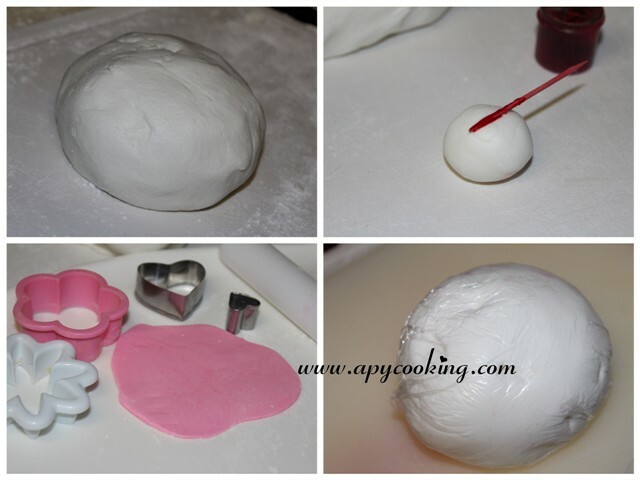 Cover fondant with a plastic wrap and store in an airtight container. Whenever you want to use it, just microwave for a few seconds, knead well and roll. Cut into desired shapes and adorn these on your cakes or cupcakes!! Mmmmmm,interesting. Looks easy though,would love to try. Awesome !! I want to try this one !! Bookmarked !! Where in Chennai can I get marshmellows. 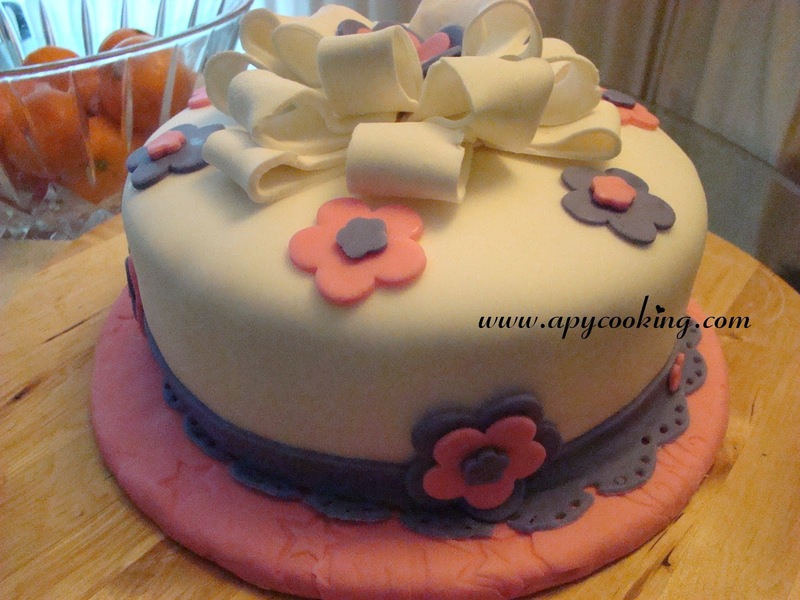 Do you take baking and cake decorating classes in Chennai. Kindly let me know. Don't know, I'm not from chennai. I used to buy them in a fast food joint called ice and spice in blore but that was just to eat. first time here,lovely blog with more cake,cookies,etc,happy to follow u.